The United States seems to be working toward courting an unexpected ally in its operations in Africa. On Aug. 9, 2017, Alexander Laskaris — an American diplomat that works for the U.S. military’s Germany-based Africa Command — visited Sudan for a series of meetings with military and diplomatic officials. The visit comes amid a gradual move toward warmer relations. In March 2016, the Sudanese government reopened the military attache’s office in its U.S. embassy after a 28-year gap. Around the same time, Washington named a military attache for its own embassy Khartoum. And in April 2017, a delegation of Sudanese military officials met with AFRICOM in Stuttgart. Washington and Khartoum aren’t natural allies. The Sudanese government has a long history of shady arms deals, genocide and harboring terrorists such as Osama Bin Laden and Carlos the Jackal. It was from Sudan that Bin Laden plotted the 1993 World Trade Center attack. In the aftermath, the U.S. State Department marked Sudan as a state sponsor of terrorism. It’s also possible that Bin Laden’s followers participated in the Sudanese civil war on the side of Pres. Omar Bashir. In 1998, U.S. president Bill Clinton ordered missile strikes on a pharmaceutical factory in Sudan that the Clinton administration claimed was doubling as a chemical weapons factory producing VX nerve gas. Not long after Khartoum entered into a peace agreement with South Sudanese separatists, a rebellion began in the mostly black Western Darfur region. 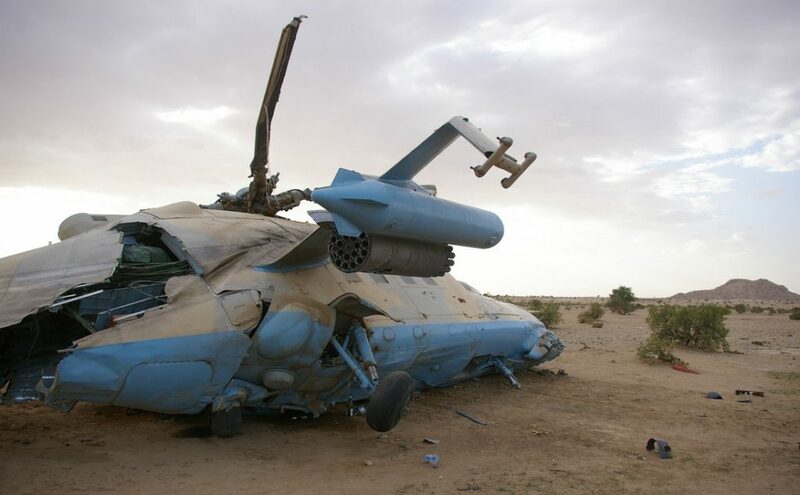 Bashir responded with a bloody air war and began arming ethnic Arab militias known as the Janjaweed. The resulting violence — which the U.S. government recognizes as genocide — has killed more than 400,000 people and displaced millions. Bashir is wanted by the International Criminal Court for crimes in Darfur, though it ended its investigation of crimes in 2015. Nevertheless, the ICC condemned South Africa for failing to arrest Bashir during a visit this summer. As recently as 2016, Sudanese forces allegedly deployed chemical weapons in Darfur. Less publicized is the bloody fighting in eastern Sudan’s Nuba mountains, where the Sudanese military regularly bombs schools and where violence and starvation have caused countless deaths. By some estimates, Bashir’s 2016 national budget earmarked as much 70 percent of the country’s total spending for the military. Among its main weapons-suppliers are China and Iran. Khartoum also has a reputation as a resale outlet of sorts, forwarding weapons to warlords and rebels across Africa. During the Ugandan civil war, Sudan was one of the main sources of arms for Joseph Kony and his Lord’s Liberation Army. Despite a long relationship with Iran, Sudan has strengthened ties with Tehran’s sworn enemy Saudi Arabia. The Sudanese military joined the Saudi-coalition fighting Iran-backed Houthi rebels in Yemen after the House of Saud’s traditional allies Egypt and Pakistan declined to answer the call. Khartoum sent planes and troops, many of whom had gotten their counterinsurgency experience razing villages in Darfur. During Laskaris’s visit to Khartoum, he and Sudanese officials discussed terrorism and human trafficking. Many displaced Sudanese — particularly Darfuris — have paid human smugglers for passage into neighboring Libya to flee violence in their country, with with many hoping to flee to Western countries, Israel or to Egypt. Sudan was one of the six countries on the Trump administration’s travel ban, which now bars refugees from Darfur and Juba. Nevertheless, U.S. and Sudanese officials seem eager to move forward on closer ties. Sudanese army chief of staff Emad Eddin Mustafa Adawi told Chinese reporters that American officials had invited Sudanese troops to attend Exercise Bright Star in Egypt. Meanwhile few in the United States have questioned whether allying with a genocidal regime is the right thing to do.